My Valentine’s gift to you. Have a blessed day regardless of your circumstances and relationships and know that you are loved with everlasting love that goes beyond that of any mortal (John 3:16). Cute I LOVE IT! We don’t really celebrate it either. I was just thinking on the way home about a picture I have of Sweet Pea looking at me through a cut out heart, and now I see you captured the gesture beautifully! Thanks, Heather! Your post touched my heart. Yes, who can compare with God who paints the sky and whispers in the breeze? Heather, that was priceless. We “celebrate” in that the kids had a little party and gave their friends cards! I’m not all caught up in expecting flowers or candy on this holiday. The most romantic thing that my husband can do for me is to help out around the house and he does that plenty! 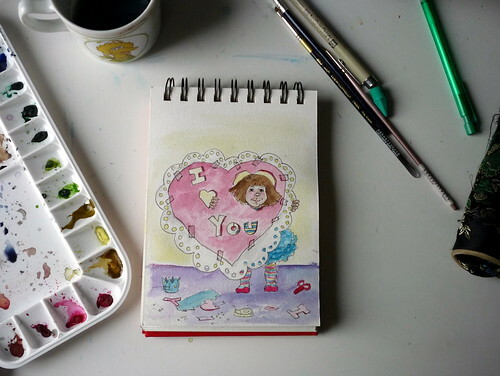 I just love your art. I want to feature you on the Artsy Mamas blog this year! Heather I just love this. How cute!! You sure are an inspiration. Thanks for sharing. Yes, with God’s love who can ask for more! That is so cute, Heather! I love it. I’m going to save it and give it to my sweetie the next chance I get. Yes, our messages sound so very similar. Ultimately looking to and finding true love in Christ. Thanks! It made my day. I love that! And I love the rumba ruffles! That’s so beautiful – you’re very talented!